For those of you with Playstation consoles, you may be familiar with the PixelJunk name. A short series of quirky downloadable games, these were all developed by Q-Games, a small studio which was started up by Dylan Cuthbert, a pivotal developer of the original Star Fox. Though Q-Games put out some high quality games on Nintendo's DSiWare service, PixelJunk was kept exclusive to Playstation Formats, but it appears that this may be changing sometime in the near future. A listing for PixelJunk Monsters was recently spotted over on the PEGI website, indicating that the game may be releasing on the eShop soon. PixelJunk Monsters was an enjoyable tower defense game that was released multiple times across Playstation platforms, so it'll be interesting to see which version is being ported over to the eShop. It'll be interesting, too, to see if Q-Games intends on bringing the whole PixelJunk catalogue to the Wii U. What do you think? Would you buy this on the Wii U? Do you think there'll be more PixelJunk games released on the eShop? Share your thoughts in the comments below. just from the picture it looks like a game i might like long as there is lots of variety. 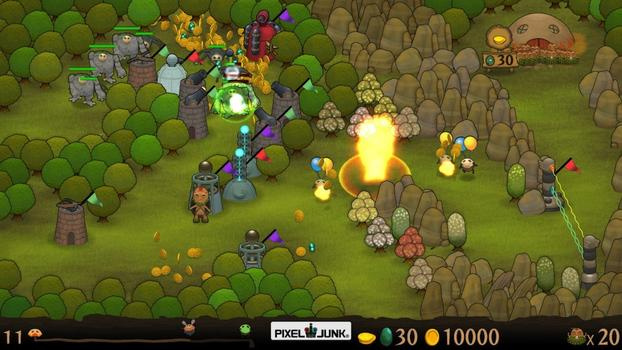 PixelJunk Shooter and its sequel are fantastic! I'd love to see both of those on the Wii U! Excellent game. My guess it'll be a port of the steam version as that's the most complete game. I think it's the best tower defense if you are into that kind of thing. Send those guys an NX device kit, pronto. Sorry, couldn't resist, all of their games were good back in the day. This and Pixeljunk Shooter are the two best of the series... but I own them on PS3. But I do encourage those who don't own them to buy this, it's fun if you enjoy tower defense games. I'll be keeping an eye on this, I loved everything they made for DSiWare. I have no idea what this game is about, but I'll keep my eyes on it. Never heard of the game but love tower defence games. This game is excellent. Well-made, tough as nails and quirky as hell. If your a tower defense fan I recommend this title ,great game as long as it has a good price point it is an older game it would be awesome if they add some new content I would pick it up it would be even more awesome if they would release Eden that title was such a blast to play on my PS3 it would be amazing on new 3DS . PixelJunk games are all top notch. Monsters just so happens to be my least favorite, though its simply because I'm not a fan of tower defense. One of my favorite PSP games. If it has any good new content or WiiU features I will pick it up again. If nothing else this looks more colorful then most in this genre. I'll definitely look into it. There should also be a video link for this as I'm sure some (like myself) would like to see it in action. With the lack of defense games on Wii U (only ZaciSa, Zombie Defense, and Tower Topple) this could be doing really well. I'm waiting for a proper defense game since Beaver Defense and Crystal Defenders R1&R2 on WiiWare. I guess Q Games is getting a good relation with Nintendo again. I wonder if we'll ever get a Croc series sequel. Shooter Ultimate is the 'indie' game with the most play on my PS4. Quirky, challenging and a ton of fun. Monsters is one of the better tower defense games out there, to the extent I've not enjoyed any quite as much. Rainbow Moon is fun, it's just not Monsters. Pretty much everything PixelJunk is gold. There's not one release I dislike. 'Monsters' has tons of personality and variety and both visually and aurally is a joy to play and a bit of a zen experience. PixelJunk Eden is another fave. I think their racer is the weakest of all of their efforts and it's STILL fun to play and head and shoulders above a lot of eStore offerings, so I wouldn't be mad if it came over as well. But 'Eden' and 'Shooter' first, please. Oh... I guess we should see how this sells first, huh.